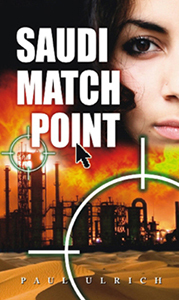 At first glance, Saudi Match Point looks like a good recreational read. But it turns out to be so much more. Reflecting the direction of spy novels since the end of the cold war, this topical thriller enters new cultural areas, having no restriction to postwar intelligence agencies and the like. What is unusual is the book's cultural setting, which reflects a lively interplay among American and Chinese culture within a country having harsh Islamic law. It contains moonshine-mongering Hash House Harriers, double agents and cross-dressing Kung Fu masters. In reading the book, one can clearly discern the limits and restrictions of widely differing cultures even as American and Chinese forces confront an aggressive Al-Qaeda plot. Ulrich's story is clearly woven, possesses all the action of top spy thrillers, and maintains admirably consistency. Further, while the cast includes enough characters to confuse casual readers, the characters are instantly recognizable as the story transports us from location to location and culture to culture. Read this book for enjoyment, and you will take away a new understanding of some of the newest forces affecting the international scene today.